Lots of performing artists have followed in the footsteps of their acting parents, siblings or extended family: just think the Baldwins, the Sheens and the Sutherlands. To celebrate the March 28 DVD release of City Island (2010), starring Andy Garcia and his daughter Dominik Garcia-Lorido, we take a look at films that featured real life family members. Struggling salesman Chris Gardner (Will Smith) has invested his life savings in a machine that nobody is willing to buy. This becomes the white elephant that eventually leads to the breakdown of his marriage and leaves him to take sole custody of his child, played by real life son, Jaden. The film’s emotive clout is underpinned by the authenticity of Will and Jaden’s relationship and is held together by the paternal bond that exists between a father and his son, making for a truly touching story. Inspired by the travels of his own son Taylor, Emilio Estevez wrote and directed The Way, a real family affair in which he casts his own father, Martin Sheen as the lead, and himself as the son who tragically dies whilst travelling. The Way is a film of real significance to the Sheen/Estevez family as Taylor and Grandpa Sheen actually journeyed the length of the Camino in the south of France – the setting for the film – whilst Sheen was on a hiatus from The West Wing. Further, Taylor actually met his wife to be on their travels. Thus, Estevez was inspired and created a film about family, loss, love, and life, and expressed it using those closest to him to convey its sincere meaning. High Fidelity is a film that evokes the simplicity of love and the complications of the cultural baggage we bring to the relationships we have with one another. John Cusack takes the lead, playing Rob, a compulsive list maker who is prone to over-analysing everything, including his relationship with the sharp Laura. Rob is at some sort of crossroads in his life and is unable to navigate it alone, destroying the one “good” thing left in his life – the relationship he had with his girlfriend. Cusack’s real life sister, Joan, who plays Liz, a long term friend of the couple, is the voice of reason that mediates between the two and ultimately plays a hand in the future of their relationship. Perhaps, it is something Joan became used to during John’s youth as she plays the part wonderfully. Donald Sutherland and his son Kiefer, who is more recently recognised as the heroic Jack Bauer, play powerful roles in the adaptation of John Grisham’s novel that also features the talents of Samuel L. Jackson, Sandra Bullock, and Kevin Spacey. Donald plays disbarred lawyer Lucien Wilbanks, whilst son Kiefer plays Freddie Lee Cob, a man responsible for recruiting folk for infamous Arian organisation, the KKK. Both actors bring with them a wealth of experience and have that introvert nature that suggests something lurks within their brooding exteriors – Donald is deceptive and seems up to no good, while Kiefer is corrupted and strong in his racist convictions. Rumer Willis has appeared in both of the above films and in each has played the child of one of her real life parents. In Striptease she is the daughter of stripper and single mother Erin Grant, played by real life mum, Demi. In Hostage she plays Amanda Talley, the daughter of hostage negotiator, and real life father Bruce. The real life connection between parent and child must have enabled the filmmakers to capture the true bond that exists between parent and child and as a result the films exhibit the real affect of suffering to those you love. The Fog gives us a rare, on-screen mother and daughter appearance, with Janet Leigh and Jamie Lee Curtis appearing together for the first time. Leigh plays Kathy Williams, a councilwoman who is also the wife of a fisherman who disappears with a group of others upon witnessing the appearance of an old decrepit vessel out at sea, whilst Curtis plays Elizabeth Solley, a young hitchhiker whose vagabond journey takes a turn for the worst. Together with local boy Nick Castle (Tom Atkins) they head out on a boat to investigate the eerie disappearance, and at once, horrific events begin to unfold. Let’s face it; we all want our mum when we are scared! Jake and Maggie Gyllenhaal are brother and sister in Richard Kelly’s indie masterpiece Donnie Darko. Jake plays Donnie, the troubled teenager who is plagued by visions of a large bunny rabbit that manipulates him to commit a series of crimes, while his real life sister Maggie plays Elizabeth, Donnie’s sister. Their bond is one typical of teenage siblings, as they mock one another in the presence of others, whilst sharing a secret bond that exists aside from their parents and those in any form of authority. Elizabeth teases Donnie for his oddball ways, and Donnie responds angrily, portraying the reality of sibling rivalry and contestation. However, their relationship comes across as fun and believable, making their on-screen bond credible and entertaining. 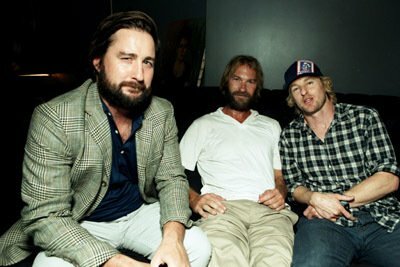 Luke and Owen Wilson have built their careers on roles based in comedy, and have appeared together in a number of film,s including their joint appearance as integral characters in Wes Anderson’s The Royal Tenenbaums. Whilst Luke plays Richie Tenenbaum, one of the many child prodigies produced by the family, Owen plays Richie’s long term friend Eli Cash. The complexity of their so-called brotherly love resonates throughout the film, as Eli has an affair with the woman Richie loves, making for amusing viewing while exposing aspects of the intricacy of brotherly love. Ben and Casey Affleck play supporting roles to Matt Damon in his eponymous portrayal of mathematical genius Will Hunting. Ben plays Chuckie Sullivan, while Casey plays the role of Morgan O’Mally. Both characters are friends of Will Hunting and want nothing but the best for their exceptionally talented friend. While Ben’s part is dominant, it is the combined performances of the Affleck brothers that eventually lends a degree of legitimacy to the portrayal of the blue collar background that Will is so fond of and afraid to leave behind. Andy Garcia plays Vince, the father of a dysfunctional family whose members all have secrets, including his real life daughter Dominik. Dominik plays Vivian, Vince’s daughter, and has recently been suspended from college, lost her scholarship, gotten breast implants, and has become a stripper to try and pay for her next semester, all of which is unbeknown to Vince. He himself has a secret though: an illegitimate child who is now a 24 year old inmate at the prison where Vince works as a guard. When Vince brings him home in the guise of hired help, he fails to tell the real truth about the man to his family. The bizarre nature of the family’s behaviour is balanced out by the performances of Garcia and his daughter, Dominik, as they successfully convey the secrets that exist within the close-knit world of family life. Sometimes we keep secrets to protect one another and at times we lie to avoid offending those we love, but ultimately we want to do the right thing in the eyes of those that we love. Garcia and his daughter Dominik evoke this powerfully as their characters struggle to keep their secrets hidden.